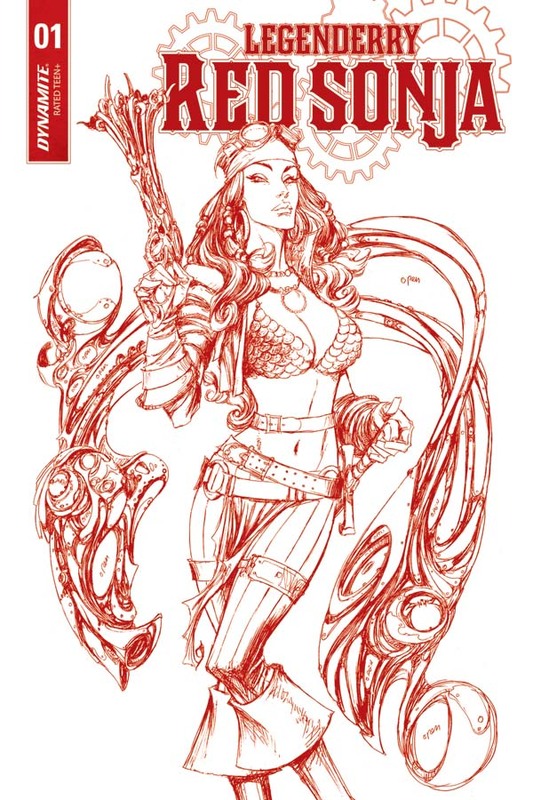 Dynamite Entertainment announces that they're bringing back the fantastical world first created by bestselling writer Bill Willingham (Fables) in 2013's Legenderry: A Steampunk Adventure with their upcoming launch of Legenderry: Red Sonja! Helmed by writer Marc Andreyko (Harley Quinn, Love is Love), with art by Igor Lima (Green Lantern Corps), Legenderry: Red Sonja #1 is set to arrive in stores this February! 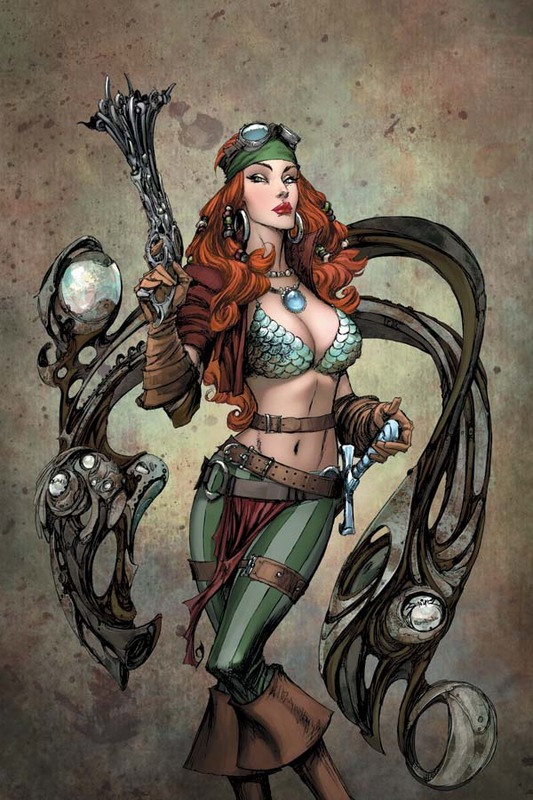 The last we saw of Red Sonja of the Legenderry world, she was living the pirate's life aboard her ship, The Nautilus. But times have changed. As she tries to rebuild her life once again, she must save the Big City from two houses divided and the star-crossed love bringing them to the brink of war! 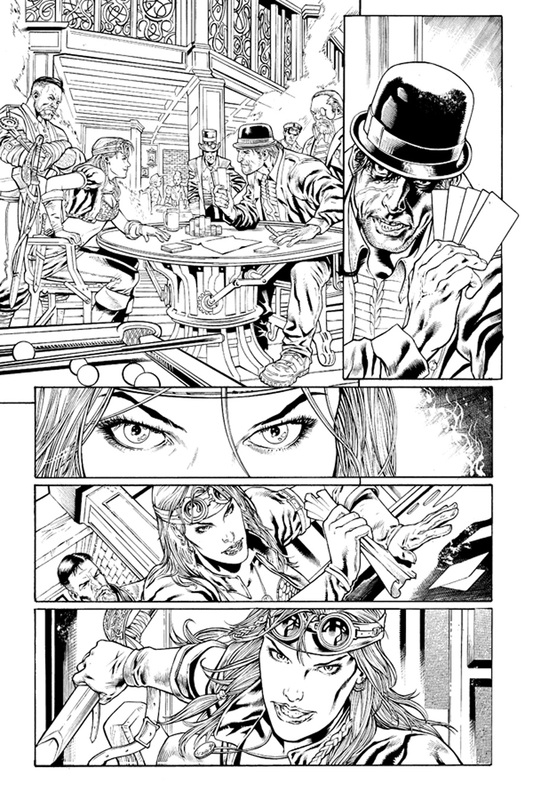 Writer Marc Andreyko says, "I couldn't have been more thrilled when the Dynamite folks asked me to do a second turn in the world of Legenderry Red Sonja! Steampunk, pirates, wizards, and one of the most unexpected guest stars of all time make this a second helping that I hope everyone eats up!" Marc Andreyko, born in 1970 Cleveland, OH, is an American comic book writer best known for his long-term run as writer for DC's Manhunter series beginning in 2004, as well as his work on the Eisner- and Harvey-award winning one-shot, What is it That Disturbs You, Stephen? Throughout his career, Andreyko has been nominated for a number of additional awards, specifically for his limited series Torso and the 1997 mini-series, The Lost. Some of his most recent titles include Batman '66 Meets Wonder Woman '77, and Wolverine vs Deadpool. "It was both an honor and a pleasure to work with Bill Willingham on his groundbreaking and imaginative world of Steampunk science-fiction in 2013's Legenderry: A Steampunk Adventure," says Nick Barrucci, CEO and Publisher for Dynamite Entertainment. "The series was incredibly successful and spawned several exciting spin-offs featuring some of our most iconic characters, including Red Sonja. 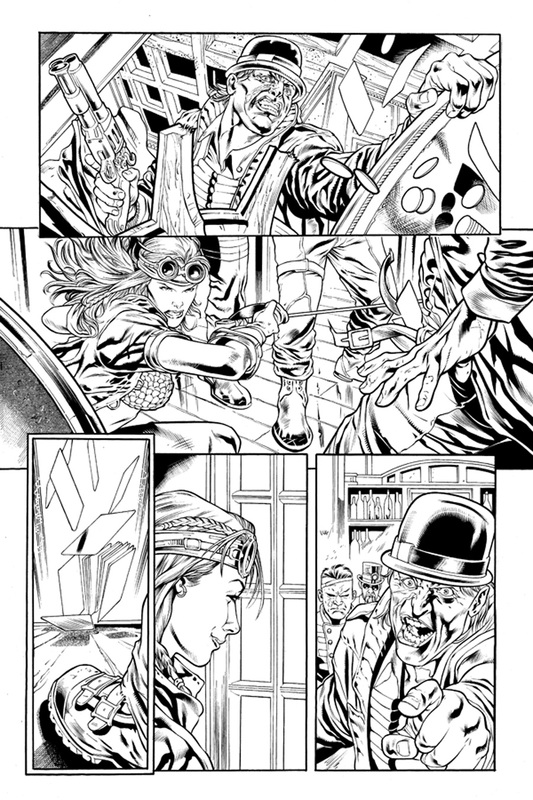 The original Legenderry: Red Sonja was a huge success, so we're thrilled to take fans on another adventure in our latest Steampunk She-Devil story, written by Marc Andreyko, whose own career has been ‘legenderry!' He's the perfect fit to lead this series and will do Bill Willingham and his amazing creation proud!" 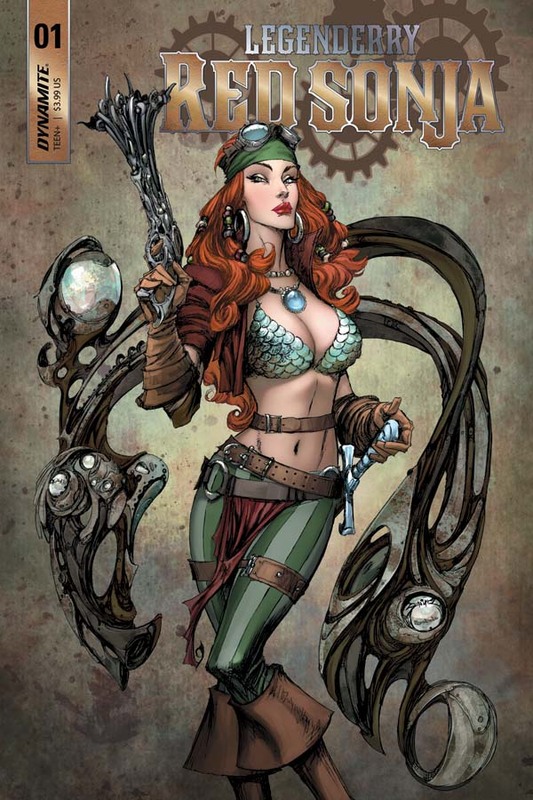 Award-winning writer Bill Willingham's Legenderry: A Steampunk Adventure debuted on December 31st, 2013, introducing comic book fans to a parallel universe where familiar Dynamite-published characters were reinvented with Victorian aesthetics and steam-powered technology. Legenderry featured a diverse cast including Steve Austin of The Six Million Dollar Man, the classic pulp duo of Green Hornet and Kato, legendary masked adventurer Zorro, horror icon Vampirella, the beloved superheroes Silver Star and Captain Victory (created by Jack Kirby), Flash Gordon and The Phantom from King Features Syndicate, and the swords-and-sorcery icon Red Sonja (2015). 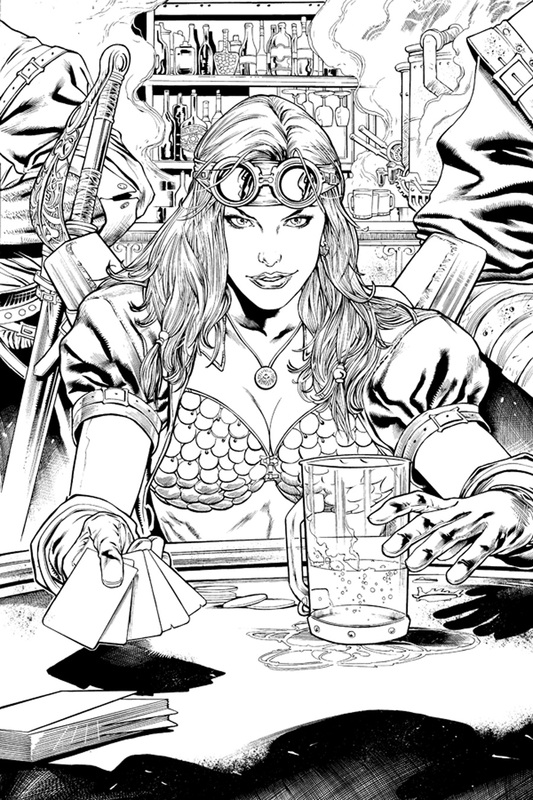 The latest Legenderry: Red Sonja will continue to expand on Willingham's universe, and fans of the original will be thrilled to rejoin their favorite character as she continues her "legenderry" adventures! The debut issue of Legenderry: Red Sonja features incredible cover art from legendary artist Joe Benitez, whose talents graced the cover of 2015's Legenderry: Red Sonja run! Additionally, a limited variant in "Black & White," "Virgin Art," and "Blood Red Line Art" formats are also available as retailer incentives for comic shops that support the launch issue by achieving stocking thresholds. Legenderry: Red Sonja #1 will be solicited in Diamond Comic Distributors' December 2017 Previews catalog, the premier source of merchandise for the comic book specialty market, and slated for release in February 2018. Comic book fans are encouraged to reserve copies of Legenderry: Red Sonja #1 with their local comic book retailers. Legenderry: Red Sonja #1 will also be available for individual customer purchase through digital platforms courtesy of Comixology, Kindle, iBooks, Google Play, Dynamite Digital, iVerse, Madefire, and Dark Horse Digital.